In these expanded liner notes we want to tell you a little of the history behind the hymns and songs on the this album, and also provide the lyrics. Click on the title of the track to jump down to the detailed histories of each of the tunes on the album. You can link to our website, www.fiddle-sticks.com for even more information about FiddleSticks, including our other recordings. And at the bottom of the page you can find some genealogical notes about our Mormon Pioneer roots. BONUS TRACKS: Three more songs by Lisa Arrington, the full 13-stanza version of Margaret Boyle's recording of the Handcart Song, some FiddleSticks instrumentals, and recording outtakes are included as MP3 files on this CD, together with expanded liner notes and lyrics. Access them on your computer CD drive by opening the Bonus Files. First, a word about the direct ancestor of this collection. In 1992, Lisa Arrington recorded and released a cassette tape recording called "Hidden Treasures," which contained many of the tunes included on "Farewell to Nauvoo." We bought a copy of "Hidden Treasures" at a Sunstone Symposium when we were living in Maryland, and Lisa's recording spent many hours in our home and car tape players. After we moved in Utah in 1996, we got to know Lisa and her family and enjoyed hearing Lisa play and sing her tunes in person. We often casually said that we should collaborate on a recording someday. Finally, many years later, someday has arrived. While we were in the studio in early 2006 mixing our " Ampersand " CD, we noticed that Steve Lerud, our recording engineer, was making one-off CD copies of Lisa's "Hidden Treasures" for her. Her tape had sold out and anyway everybody had replaced their cassette players with CDs. We got a CD and loved hearing the tunes again, and that was enough of a catalyst to get us and Lisa working seriously towards this recording. The only hitch was that by the time we got the project in motion, Katie was just a few weeks from leaving for her missionary service in South Africa -- so we got her into the studio and put the fiddle (and viola) parts down first, and then over the next months, built up the rest of the arrangements. Many of the tunes on this CD are tunes FiddleSticks has played for years and even recorded before with different arrangements, and it has been a pleasure to work with Lisa and enjoy her interesting and sensitive arrangements. Best of all, Lisa is a storyteller. We love hearing these lovely old hymns and songs through her colorful and personal vocal perspective. She doesn't just sing the songs - somehow with her singing she tells the stories in a way that brings to life the people we call the Mormon Pioneers. The music traditionally played with this hymn is called "Man of Grief," a tune written by George Coles (1792-1858). However, Coles wrote another tune, "Duane Street," which was also commonly used with this hymn text. The Duane Street tune appeared with this hymn in the original 1844 edition of the famous shape-note hymn book, "Sacred Harp," compiled by Benjamin F. White. Duane Street is the tune we have used for this recording. Coles was born in England, became a preacher at age 22, and then emigrated to American when he was 26 in 1818. While we like the "Duane Street" melody better, it is quite clear that the "Man of Grief" version was the tune used most often for this hymn in Nauvoo and by most of the Mormon pioneers thereafter. It appears in the 1844 "Bellows Falls" LDS hymnal with the "Man of Grief" melody. (The Bellows Falls hymnal was an unofficial hymnal published by church members J. C. Little and G. B. Gardner, formally called "A Collection of Sacred Hymns for the Use of The Latter Day Saints" in Bellows Falls, Vermont, which contained 48 hymns, 31 with musical notation.) John Taylor made a point, when he sang it later in life to the "Man of Grief" melody, to state that he sang it just as it had been sung in Nauvoo. However, the Duane Street version was also popular in Mormon congregations in Utah for many years. That is the tune we have used for this recording. This is one of our most favorite hymns, and was very popular among the Mormon pioneers. Its removal in the 1985 edition of the Mormon hymnbook was a mistake that will have to be corrected in the next edition. Let's hope that's not too long in coming. We recorded this hymn before, on our "Return to Nauvoo" CD in an upbeat, energetic style. But we really like Lisa's unaccompanied vocal version, which so well reflects the simple majesty of this hymn. Robert Robinson started life as an apprentice barber, but eventually became a controversial Baptist preacher in England. This hymn was written relatively early in his career, and while he enjoyed several years of stormy popularity, personal problems subsequently overtook him. According to one story Robinson encountered a woman who was studying a hymnal, singing aloud "Come Thou Fount of Every Blessing." He supposedly replied, "Madam, I am the poor unhappy man who wrote that hymn many years ago, and I would give a thousand worlds, if I had them, to enjoy the feelings I had then." Lucretia Hupper was a young woman of 22 years when she heard the Mormons preaching in her hometown in Maine. She believed what she heard and joined the gathering in Nauvoo. She kept an extensive diary, and composed verse to reflect significant events in her life, such as her conversion to Mormonism. When a few years later she and the other Mormons were driven out of their homes, she again wrote a poem, which she titled Farewell to Nauvoo. We revised the words just a little for our recorded version. See http://www.mowerfamily.org/life/hupper.html for Lucretia's life history. Liz Davis, our cellist, composed the melody for this song in the style of an American folk hymn. We think the words and melody work well together, conveying both the sadness of loss and the hope for the future that must have been common emotions for the early pioneers. We provide here first the lyrics as we have adapted them for this recording, and below give the full text of the poem. We are called now to leave for a far distant clime. Farewell for a season, Farewell to Nauvoo. The precept of life and salvation declared. Although to a far distant country we move. And boldly declared the whole council of God. And seek in the far western forest a home. With beams of salvation and glory divine. We're now called to leave thee for a distant clime. Farewell for a season, our own loved Nauvoo. Forced him from our midst to a peaceful abode. Although in a far distant country we move. Our own native country, the proudest on earth. Of Joseph and Hyrum, the prophets of God. J.D.T. McAllister joined the Mormon church in Philadelphia in 1844 when he was 17. In July 1847, when the first Mormon pioneers were arriving in Utah, he married Ellen Handley in Pennsylvania at the age of 20. In 1851 he and his family made the journey to Utah, by wagon train - not by handcart. He played the cornet in one of the first music groups in Salt Lake City, "Captain Domenico Ballo's brass band," which provided the music for the groundbreaking of the Salt Lake Temple in 1853. In his diary he wrote that "the musicians formed in a circle and gave a cheering strain to 'Auld Lang Syne.' Soon after that he left on a 3-year mission to England and on the way delivered a carved block of stone for the Washington Monument to Washington D.C., inscribed with "State of Deseret" and "Holiness to the Lord." http://www.nps.gov/wamo/memstone_546.htm . In 1856 while he was a missionary in England he wrote the "Handcart Song." It is addressed to those European converts who were contemplating the difficult journey to Utah, encouraging them and reflecting the hope and persistence of those handcart pioneers. His return from his first mission in 1856 put him on the Mormon Trail at the same time the first handcart pioneers were making the journey. He served another mission to the British Isles in 1860, and on his return from England in 1862 he brought a large company of emigrants overland to Utah. While we really like Lisa's arrangement of this song, our favorite rendition of the Handcart Song was sung and recorded in 1951 by an actual Mormon pioneer named Margaret Graham Young Boyle. Margaret was born in 1854 in Kirkintilloch, Scotland and immigrated with to Utah with her parents and 12 siblings in about 1872. (Actually there's a little question about her year of birth: she says on the recording that she was born in 1854, but her pedigree at www.familysearch.org says it was 1855, and her Salt Lake obituary made it 1853.) Margaret's recording of the Handcart Song was made by Utah folklorist Lester A. Hubbard. As she says on the recording, Margaret was 97 years old when she recorded this song; she died in July 1952 just a few months after making the recording. The recording is now in the University of Utah library special collections archives, and we have included it on this collection with their permission. We thank Hal Cannon, founder of the Western Folklife Center , for having converted Margaret Boyle's Handcart Song recording from the acetate tape version in the archives and providing us with the digital copy. By the way, if the lyrics seem unfamiliar, it's because McAllister's text was changed and a new different verse was added by Lucile Cardon Reading (1909-1982) when it was turned into a children's song (now contained at page 220 of in the Primary Children's Songbook). Until we reach the Valley-o! Thus lend a hand to pull the same! To cross the plains with our handcart. To cross the plains in your handcart! And rich men's dogs are better fed. And we'll cross the plains in our handcart. For we crossed the plains in our handcart! In early February Katie was in the studio with Steve Lerud, our engineer, working on recording the fiddle arrangements for some of the tunes on this collection. During a moment between takes, Katie started noodling with a new melody in an Old-Time style. Steve started recording, and said - "hey we should keep that!" In a couple of takes Katie had composed this tune. The pioneer companies often had musicians to provide entertainment and inspiration along the way. We think the Mormon pioneers would have liked having Katie and her fiddle along on the trail. Our ancestor, Parley P. Pratt, was given a direct instruction from Joseph Smith to preach to the Shakers together with Sidney Rigdon and Leman Copley. See D&C Section 49. Bright scenes of joy and bliss. O Lord Jehovah art Thou here? This light proclaims Thou art. And bless the meek and low. The humble heart is mine. And rise beneath the stroke. Before them I will walk. In 1833, while traveling in Italy as a young priest, John Newman fell ill for several weeks. During his illness he gained the strong impression that he had to go to England to do the work of God. Finally he took passage in a freighter filled with oranges headed for France, and while in route he wrote the hymn, "Lead, Kindly Light," which almost immediately became popular worldwide. The tune was written by an English churchman, John B. Dykes - one of 300 hymn tunes he wrote. As to this arrangement, Lisa writes: "In August of 1990 I sat by the bedside of my sister, Patricia, who was dying of cancer. Although not an active Mormon, she loved this hymn and asked that I sing it at her funeral. I went home and felt deeply inspired during the arrangement of this hymn. It was a painful experience but the Lord blessed me with courage and grace and within two days I completed the song and sang it one week later at her Memorial Service. It was a very moving experience for me. This arrangement is dedicated to her memory." Levi Hancock was an early member and leader of the Mormon church, having joined in November 1830, just six months after the church was organized. He was a member of Zion's camp, an early settler of Missouri and of Nauvoo, a member of the Quorum of the Seventy. Levi was also the only LDS "General Authority" to march with the Mormon Battalion from Iowa to Mexico, and then to California. He is listed on the official roster of the Battalion as "Company E Musician." It was during this trek that he wrote this ballad. He wrote several songs about Mormon life, and was good friend of Joseph Smith and Brigham Young. "I have come among you, instructed by Col. S.F. Kearney of the U.S. Army, now commanding the Army of the West, to visit the Mormon camp, and to accept the service for twelve months of four or five companies of Mormon men who may be willing to serve their country for that period in our present war with Mexico; this force to unite with the Army of the West at Santa Fe, and be marched thence to California, where they will be discharged.... This is offered to the Mormon people now. This is an opportunity of sending a portion of their young and intelligent men to the ultimate destination of their whole people, and entirely at the expense of the United States, and this advanced party can thus pave the way and look out for the land for their brethren to come after them." Naught less than broke down mules to eat." We listened to the howls of the loathsome roving wolves. As we listened to the howls of the loathsome roving wolves. As we listened to the howls of the loathsome wolves. As a cheat for the red man and loathsome howling wolves. We arose in the morning as soon as 'twas day. We then bid good-by to the loathsome howling wolves. The Shaker hymn "Love is Little, Love is Low" expresses in its mild simplicity the Shakers' abiding belief in humble faith and fellowship. The hymn comes from South Union, Kentucky and was written in about 1834 - the time the Mormons were gathering to the mid-western United States from New England. The hymn was first transcribed and published in 1976 by Roger Hall in his collection, "A Western Shaker Music Sampler." Our mutual friend Roselle Hamblin came across that booklet of Shaker spirituals during a visit in rural New York and was sure Lisa would like "Love is Little." Lisa did like it - in fact she liked it so much that she wrote three more verses for the hymn. So the first verse is the traditional text, while verses 2, 3, and 4 were written by Lisa Arrington. Augustus P. Blase, one of the most prolific Shaker hymn writers, wrote this hymn in three-part harmony, probably sometime in the 1860s. Lisa discovered this hymn in a collection published by Dover in 1962 called "The Gift to be Simple" edited by Edward Demin Andrews. We must admit that even though this hymn was popularized at the height of the Mormon pioneer movement, there's no evidence that the Mormon Pioneers ever sang this Shaker hymn. But its message is so on point, we think they should have! We think it speaks particularly to missionaries - and we were happy to send this hymn and its message of faith and zeal with Katie, our fiddler, who left on a mission to South Africa just a few days after recording this CD. Anew, anew, for the kingdom of Heaven. Toiling on, struggling on, for a perfect Heaven. This hymn is based on one of Eliza R. Snow's most well-known and beautiful poems, written while she was in mourning for the death of her husband, Joseph Smith. The poem was originally titled "My Father in Heaven" and was published in the Nauvoo Times and Seasons (15 Nov. 1845). More than ten years later, the poem was set to Stephen Foster's tune "Gentle Annie" and soon became one of the most popular Mormon hymns - indeed it was said to have been Brigham Young's favorite hymn. It is especially important in Mormon doctrine as one of the few written acknowledgments of the Mother in Heaven. The melody originally used for this hymn, and the melody we use on this collection, was written by Stephen Foster in 1856 and called "Gentle Annie." Foster's music was immensely popular and influential at the time the Mormons were making the trek westward. Various other Stephen Foster songs were given new Mormon lyrics, including "Brighter Days in Store" written to the Foster tune "Hard Times." Eventually the Foster melody was replaced with two other settings, one using a tune from an opera by Friedrich von Flotow's, and the other based on a popular gospel hymn "My Redeemer," written by James McGranahan. The "My Redeemer" hymn spread quickly through the Church at the end of the 19th century and continues to be the tune most often used today. We think the Gentle Annie melody has a poignancy that is missing in the later settings, and so we're glad to present this recording as a kind of revival. Was I nutured near thy side? Katie learned this lively jig from the Kane Sisters of Galway, Ireland. It seems to follow the Handcart Song nicely, reflecting the origin of so many of the handcart pioneers in the British Isles. Paddy Fahy wrote dozens of jigs, but he modestly named them all "Paddy Fahy's." Some of them have evolved informal sub-titles so musicians can discuss them without having to hum a few measures. Maybe this one will become known as Paddy Fahy's Handcart Jig? The song text was first printed in a hymn collection called Bever's Christian Songster in 1858, but the author of the words is unknown. The origin of the melody is similarly mysterious. The tune is thought to have originated as an African-American spiritual called "The Pilgrim's Song." Some sources attribute the tune to a preacher in Alabama named Rev. C.G. Keith, but just as many claim the tune is a traditional American spiritual. The hymn was included in early editions of the Sacred Harp. In concert with that blood-washed band. This arrangement is inspired by Marvin Payne's 1975 folk performance of this hymn, and was Lisa's first hymn arrangement. Adam-ondi-Ahman is a place in western Missouri that has almost mystical significance as the site of the Garden of Eden, and as the future location of the City of God. This hymn tells of the "place of land of God where Adam dwelt" spoken of by the prophet Joseph. It is now a beautiful scene of rolling hills and woods, and this very American hymn celebrates both its past and its future. This hymn is one of the oldest original Mormon hymns. It was written in about 1832 and was first published in the Messenger and Advocate, June 1835, just five years after the church was organized. Within months of its publication it became the most popular hymn in the Church, and remained so until the Nauvoo period. It was included in Emma Smith's 1836 hymnal, and unlike most of those early hymns, it has remained in all subsequent church hymn books. William W. Phelps (1792-1872) wrote the words, as well as dozens of other Mormon hymns, including Now Let Us Rejoice and The Spirit of God, both of which, together with Adam-ondi-Ahman, were sung at the dedication of the Kirtland temple in 1836. Interestingly when the hymn was written in about 1832, it was some six years before the place now called Adam-ondi-Ahman was identified. The hymn had reference to early Mormon scriptures that identify Adam-ondi-Ahman as the place where Adam lived and blessed his children before his death. D&C 78:15-16; 107:53-55. Only later, on May 19, 1838, did Joseph Smith identify the place in Daviess County, Missouri as Adam-ondi-Ahman. A town by that name with as many as 1500 inhabitants prospered until the Mormons were expelled from Missouri in March 1839. The tune of "Adam-ondi-Ahman" comes from the hymn "Prospect of Heaven," included in the popular collection of southern Appalachian folk hymns, The Southern Harmony and Musical Companion (commonly known as Southern Harmony), published by William Walker in 1835. That book was the source of several old LDS hymns, though the shape-note "sacred harp" type of singing that typified those hymns would sound quite unusual to those accustomed to the modern Mormon hymnal way of singing. *Originally "This world was once a garden place"
**Originally "Beyond old Israel's Canaan"
Words: David Smith (1844-1909); Music: Unknown. This song was written by David Smith, youngest son of Joseph and Emma Smith, who was born in November of the year his father was killed. David never knew his father but loved and revered him and was deeply committed to his father's mission. Thy hymn refers to the graves of Joseph and Hyrum that were hidden soon after the martyrdom to prevent desecration by mobsters. More symbolically, of course, the song also refers to the father David loved but never knew in this life. While David Smith remained part of the "reorganized" LDS movement, it is interesting that this song has never appeared in any of the hymnals of the RLDS/Community of Christ church. It was included in a Utah Mormon hymnbook called the Deseret Sunday School Songs, published in Salt Lake City in 1909. In that hymnal, the melody is also attributed to David Smith, but recent scholarship has shown that despite his many talents, David Smith did not write music, casting doubt on the attribution of the tune to him in Deseret Sunday School Songs. The form that it covers will ne'er be forgot. Their fragrant white blooms o'er the unknown grave. While over the bosom the wild thistles spread. Low in the unknown grave. Sleeps now where no hand may disturb his repose. God bless that unknown grave. No more an unknown grace. We have included on the CD as Bonus MP3 Tracks the two tunes on Lisa Arrington's original 1992 "Hidden Treasures" recording that we have not re-recorded on this CD, plus one that we did re-record but have decided to present as a bonus tune. In addition, here are some informal recordings of tunes by FiddleSticks, and an accidental "outtake" recording captured during the recording session. The complete recording of Margaret Graham Young Boyle singing "The Handcart Song" is included as an MP3 with the Bonus Tracks. The melody for this hymn is the American Shaker song "Simple Gifts," which was a dance song written by Joseph Brackett, Jr. in 1848, and sung by the Shakers (more formally called the United Society of Believers in Christ's Second Appearing). It was first published in The Gift to be Simple: Shaker Rituals and Songs. Shaker worship included dance, and that is reflected in such lines of the song as "turn, turn will be our delight" and "turning, turning we come round right". The song became well-known in the mid 20th century when Aaron Copland used the tune in his ballet Appalachian Spring, and later included it in a set of Old American Songs. The words Lisa sings in our new recording are actually relatively recent. English poet and musician Sydney Carter wrote the Lord of the Dance lyrics in 1963. It quickly gained status as a favorite folk hymn, and is often incorporated into annual "Christmas Revels." It is used here by permission of Hope Publishing Co., Carol Stream IL; (c) 1963 Stainer & Bell Ltd. (ASCAP). As Lisa describes the hymn text, "Its simple and expressive language vividly expresses my love and belief in Jesus Christ as my Redeemer. The image of Christ leading the dance with all man- and womankind fills my soul with tremendous joy." The arrangement presented in the bonus track was recorded at the same time as the other tunes on "Farewell to Nauvoo." The piano and vocals are by Lisa Arrington and it includes FiddleSticks members Katie on fiddle, Liz on cello, and Becca on flute. We really like this arrangement, but in the end we decided that with the new words (written just a few years ago), couldn't really be considered a hymn of the time of the pioneers. So here it is as a bonus MP3. We hope you'll like it! Copyright 1963 Stainer & Bell Ltd. London, England, used by permission of U.S. administrator Hope Publishing Co, Carol Stream IL 60188 (ASCAP). The arrangement presented as an MP3 with the bonus tracks was recorded by Lisa Arrington in 1992 and is reproduced here from her "Hidden Treasures" album. While we didn't re-record it for the "Farewell to Nauvoo" project, it is too lovely a tune to leave forgotten on cassette forever, so here it is and a bonus file. "Hidden Treasures" was recorded by Guy Randle at Rosewood Recording and produced by Guy Randle and Ken Hodges. (c)1992 James Arrington Productions. A lamp has shone along my way. Until I reach the heavenly field. I bid a long, a sad farewell! When you shall reach the gates of hell. To hear the dismal waters roar! And to the regions of despair? When through the gates of death I sail! Till at the judgment bar we stand. Shall shake the globe from pole to pole. Shall in a moment cease to roll. And take his ransomed people home. This is a Shaker version of the Lord's Prayer, very slow and reverent. The Saviour's Universal Prayer was originally written in 1845 at Christmastime. It was published in James Richardson's hymnal, from South Union, Kentucky. This recording is also from Lisa Arrington's 1992 "Hidden Treasures" album. "Hidden Treasures" was recorded by Guy Randle at Rosewood Recording and produced by Guy Randle and Ken Hodges. (c)1992 James Arrington Productions. In earth as it is done in heaven. Lead us not in temptation but deliver us from evil. These are two instrumental tunes recorded on the fly by Nate Keller in his living room during a jam session in February 2006, just a couple of days before Katie left for her mission to South Africa. The recordings are informal and unpolished, but both are traditional tunes might have been heard on the Mormon trail at day's end as the musical instruments were brought out around the campfire. And they give you a hint of the virtuosity of Katie and Liz as instrumentalists. Pickin' the Devil's Eye, or also called "Pick the Devil's Eye Out", is a traditional Ozark Mountains fiddle tune, done here by the dueling fiddle/cello combination of Katie and Liz. Katie and Liz perform an energetic version of this 19th century fiddle tune that was used by infantry fiddlers during the Civil War to taunt the opposing side. Recording sessions can get a little long, and sometimes Katie will relieve the boredom by spontaneously breaking into an improvised and never to repeated tune, composed on the spot. Usually these gems are lost forever, but Steve Lerud, our engineer, happened to capture this one when he left the recording equipment accidentally running after a take. It will probably never make the top ten, but at least Steve can now truly say he has a blues tune named after him. Joshua and Susan are our paternal great-great-great-grandparents, that is, the parents of our father's father's father's father. Susan's parents joined the Mormon faith in Kirtland Ohio, and then moved with the church to Missouri. Joshua's family, was originally from Annapolis, Maryland, and Joshua himself was born when the family lived in Illinois. But before Joshua was grown his father moved the family to the western frontier, to Caldwell County Missouri. There they encountered the Mormons, who considered western Missouri their New Jerusalem. 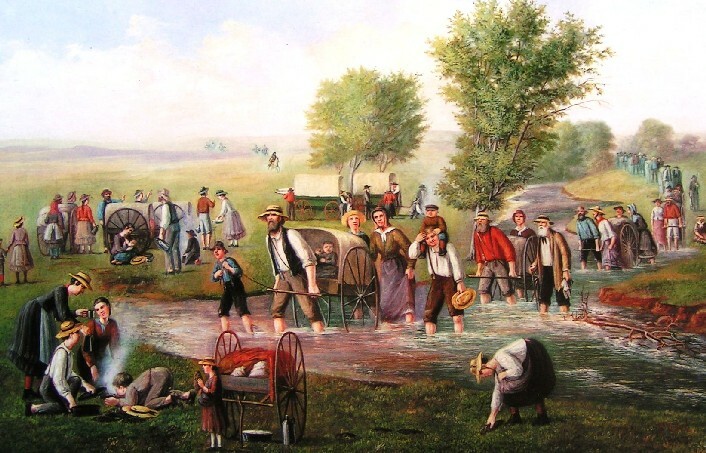 When mob persecution and the Missouri government's extermination order required the Mormons to leave Missouri, Joshua went with the church to Nauvoo, and was baptized there in 1840 by Orson Hyde. Later that year he and Susan Ann were married in Nauvoo. One of our persistent family legends is that Joshua helped in building the Nauvoo Temple, working one day in ten at the temple, as a direct tithe. He was well acquainted with the prophet Joseph Smith and, so the story goes, one cold day, Brother Joseph saw Joshua on his way to the temple site in a pair of worn shoes strapped together with hickory bark. According to the story, Joseph took pity on Joshua's frozen toes, and gave him a new pair of boots. After Joseph was murdered, Joshua and Susan Ann fled Nauvoo in 1846 with their two small children, and two more were born in Iowa as they prepared to move to Utah. Finally in 1849, they arrived in the Salt Lake Valley, but then settled in the new village of Provo. They build their first home inside the fort that was built to protect the new settlers from attack by the local Indian tribes who resented the newcomers. Joshua was the town's first sheriff. He married two other wives in Provo, that being the norm then for successful Mormon men, served several missions for the LDS church, owned considerable farmland in Provo and Orem, and raised 18 children. Parley and Mary Pratt are our maternal great-great-great-grandparents, that is, the parents of our mother's father's father's father. Parley was one of the earliest converts to Mormonism, who joined the church in 1830 in New York, soon after it was organized. Mary was from Glasgow, Scotland, and met Parley when he was the mission president in Britain. When she joined the Mormon church her parents disowned her, and Parley invited her to come to America and stay with his family in Nauvoo. In time, he proposed to her, and in 1844 she was married to him by Brigham Young in the yet unfinished Nauvoo Temple, becoming Parley's fourth wife. Parley was an energetic church leader, and was always away on one mission after another. Essentially being single moms, Mary and her other "sister wives" depended on each other as family. When the Mormons were expelled from Nauvoo, Parley was away, and Mary made her way in a wagon over the frozen Mississippi river in February 1846 to Iowa. Before she made it to the settlement in Mt. Pisgah, her son Helaman (our ancestor) decided it was time to arrive, and he was born in a wagon on the trail. She crossed the Great Plains to Utah in the second pioneer company in June 1847, together with Parley and six of his other wives. Lars and Bodil Madsen of Svinninge, Denmark, determined to join the gathering to Utah after they joined the Mormon church in 1854. They sent five of their seven children ahead in 1855, since there was money enough only for their passage. Parents Lars and Bodil followed the next year, sailing from Copenhagen in November 1855 with their youngest son. After arriving in St Louis, they set out on July 31, 1856 with the Hodgett ox-team wagon company, one of three ill-fated companies that left St Louis too late in the season. The Madsens' relatively well-provisioned company encountered along the way the several hundred destitute immigrants in the less well prepared Martin and Willie handcart companies. In delaying their journey to aid these travelers, they shared their fate. Traveling together, they were surprised by an October blizzard near Devils Gate, Wyoming. They became snowbound and, ill equipped for winter weather and out of provisions, hundreds died of exposure. Among the casualties was Grandpa Lars, then aged 62, who was buried in the snow near the Sweetwater river, leaving Bodil and her 9-year old son to continue the journey alone. They continued on, eventually settling in the Danish colony of Mt. Pleasant in central Utah with her other children. Lars and Bodil's daughter Annie Margrethe, who was 19 when her father died in Wyoming, was our Grandma Louise's great-grandmother. Anders Jonsson's family accepted the Mormon religion in Sweden, as also did Eda Regina Johansson's. While they were children, their families moved to America and in 1862 joined the trek across the plains of the "great American desert," walking with their worldly belongings (and their babies) from Nebraska, across Wyoming and at last into the Salt Lake Valley. Anders and Eda Regina grew up in Heber City Utah, and when he was 17, he made a beautiful pine cabinet for Eda as an engagement proposal. She accepted and they married and had seven children. Anders was a skilled carpenter who was a craftsman on the Heber Tabernacle, which still stands. Their daughter, Louise Elizabeth, was our own Grandma Betty's grandma. The cabinet Anders made is still in our living room. My maternal great great grandparents were Nathan Tanner Porter and Rebecca Ann Cherry. Nathan was born in Corinth, Vermont, July 10, 1820. Relocating to Tazewell County, Illinois, the family joined the church there in about 1832. For the next five years they endured the trials of the saints' persecution which eventually resulted in the expulsion from their settlement in Illinois. In 1841, Nathan was called to serve a mission to the Eastern States until 1842 when he returned home to Lee County, Iowa. In May of 1844 he was asked to present a document written by Joseph Smith, "upon the policies and powers of the Federal Government." While on board a Mississippi steamboat enroute to St. Louis, he read this statement to a prominent lawyer who commented, "Gentlemen, that is a masterpiece of statesmanship, and if Joe Smith is let alone, he will go into the Presidentiaol chair. I'll vote for him!" Although encouraged by these comments, their hopes were dashed by the news of the martyrdom one month later. Handcart Illustration: The handcart image is titled "Mormons Crossing the Plains" and was printed in an 1856 newspaper. The image was provided to us by rare book dealer Rick Grunder in Lafayette, New York ( www.rickgrunder.com ). (He was also the source of the " Return to Nauvoo " cover.) Rick says that this image is the only original illustration of the time which he has seen, showing actual handcart pioneers. However, some of the pictorial newspapers cheated a bit on their illustrations, so you cannot stake your life on the total accuracy at times. For instance, if you look very closely, the man in the foreground pulling the handcart seems to have a pipe dangling from his mouth - although that could be accurate in those days - who knows! 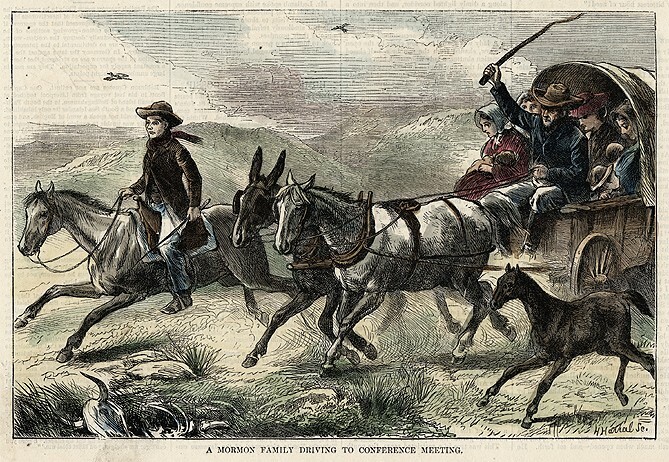 Driving Wagon Engraving: This amusing image of pioneers traveling in a wagon appeared in Harpers Magazine in 1874. It is titled "A Mormon Family Driving to Conference Meeting." The joke is, of course, that there is but one man among a crowd of women and small children. Maybe it is accurate, maybe not, but what an image! 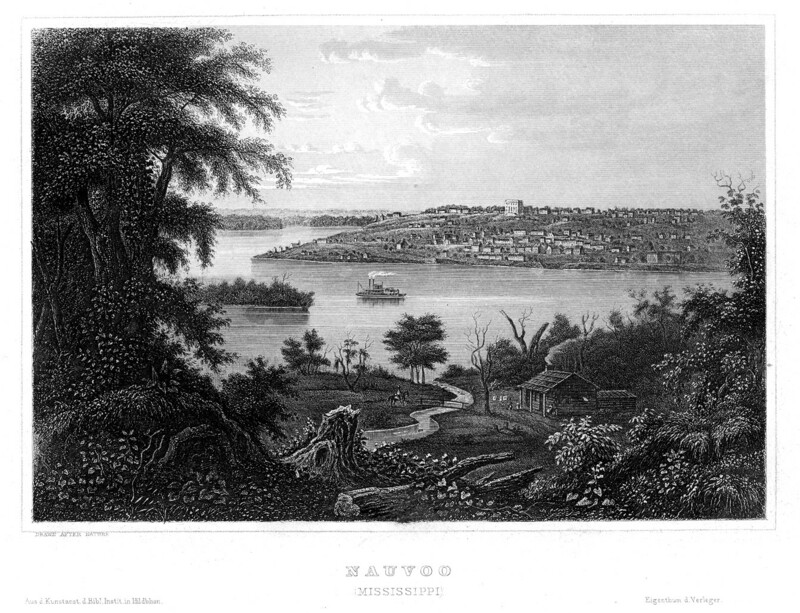 Nauvoo River View (on the CD itself): This classic view of Nauvoo was done in Germany in the 1850s, and shows the ruins of the Temple towering over the abandoned Mormon city. The family band FiddleSticks and Lisa Arrington have combined their talents to present this new collection of hymns and songs from the Mormon Pioneers and from other hymn traditions of nineteenth-century America. This "Farewell to Nauvoo" album is a sequel, in two ways. It is a kind of Volume Two in a Series, following up the FiddleSticks CD from 2004 called "Return to Nauvoo." At the same time, many of the arrangements on this album appeared first on Lisa Arrington's 1992 solo recording "Hidden Treasures." Lisa and the Davis family have been friends for many years and this long-awaited collaboration has produced some lovely new arrangements of favorite old melodies, fusing Lisa's vocals and imaginative piano arrangements with the eclectic FiddleSticks Celtic style. Lisa Arrington is a storyteller. By giving these lovely old hymns and songs her colorful and personal perspective, she tells the stories in a way that brings to life the people we remember as the Mormon Pioneers. Lisa Arrington wrote the piano arrangements on this album, and recorded all of the piano and vocal performances. The FiddleSticks family musical group provided the other arrangements and instrumentation, with additional harmonization by Andrew Maxfield. Performers on this collection include Katie Davis on fiddle and viola; Liz Davis on cello; Becca Davis Stevenson on flute; Mark Davis on bodhran; and Andrew Maxfield on guitar and accordion. Thanks to our sound engineer and co-producer Steve Lerud for his careful ear and musical sensitivity. To Cindy Ferguson for her Pearl Award-winning album design. To Hal Cannon and the University of Utah J. Willard Marriott Library Special Collections for the recording of the Handcart Song sung by Margaret Y. Boyle. Recorded and engineered by Steve Lerud at Lakeview Recording in Orem, Utah ( www.lakeviewrecording.com ), except flute parts recorded by Karl Kasberg at Lava Tracks Studio in Kamuela, Hawaii ( www.lavatracks.com ). Mastered by Steve Lerud. Art design and layout by Cindy Ferguson, www.cindyferguson.com . Cover image: detail from Handcart Company, by C. C. A. Christensen (1900, oil on canvas, 25" x 38"), Church Museum of History and Art, Salt Lake City. Thanks to Rick Grunder ( www.rickgrunder.com ) for providing pioneer images for the internal design. Distributed by Deseret Book Distribution, Salt Lake City, 801-517-3310. Arrangements, performances, and liner notes copyright (c)(P)2006 FiddleSticks -- Celtic and American Folk Music. All Rights Reserved. "FiddleSticks" is a registered trademark of the Davis Family Folk Band. For booking performances or other information about Lisa Arrington call 801-367-3802 or email dulcimur9@comcast.net. For booking or ordering information about FiddleSticks call 800-969-7640 or email marco@fiddle-sticks.com. (c)(P) 2006 FiddleSticks Celtic and American Folk Music. All Rights Reserved.